Yair Agmon ('04) - Pnei Zaken: In the Presence of the Aged – a Web Documentary. A documentary web series dedicated to exploring different aspects of the thing we find so scary to deal with: old age. Zohar Atkins ('05) - Torah as Poetry, Poetry as Torah. Talented, eclectic writers gather in NYC to write and read poems on classical themes from Jewish tradition. Eli Batalion ('97) - Trust - A Short Film. Can you really trust your "trusted" financial advisor? This short film explores themes inspired by the Madoff Ponzi scheme. Avlana Eisenberg ('93) - The Musicians of Bremen. Banished from the barnyard for being different, a ragtag group of animals form their own family in this magical musical family tale scored by a chamber orchestra. Michael Grumer ('04) - "Lone Parents" - A national support network for parents of individuals who have moved to Israel to serve as lone soldiers in the Israel Defense Forces. Nadia Kalman ('92) - Russian Jewish Literature: Online Resources for Teaching and Learning. Contemporary Russian Jewish Literature: border-crossing resources for the classroom and beyond. Alex Maged ('11) - What's Pshat? What's Pshat? is a blog dedicated to sharing original literary and interdisciplinary readings of the Torah Parshah with 1300+ weekly subscribers. Sari Schlezinger Marsha ('08) - Renewing the Old. Renewing the Old is a project aimed at transforming the field of encounter between rabbinical students at national-religious Yeshivot in Israel and liberal North American seminaries. Leah Mundell ('90) - Migrant Lives and Leadership. The "Migrant Lives and Leadership" photo exhibition provokes community discussion about our connection to migrants locally and globally. Alex Riff ('03) - Israeli Novy God. “Israeli Novy God” is a nationwide project meant to introduce the Soviet‐Israeli holiday to the wider public, thus making it an inseparable part of Israeli culture. Margie Klein Ronkin ('96) - Race Training: Building Beloved Community. Training that builds relationships and understanding across race, class, and faith amongst leaders working together on criminal justice reform. In the photo above, Rabbi Margie Klein Ronkin and ECCO leaders hold non-violent direct action to protect immigrant families. Hannah Sarvasy ('99) - Preempting the tidal wave: The Nungon Community Technology Centre. Introduce tech to New Guinea rainforest hamlets in the local language to promote language sustainability in the digital age. In the photo above, three generations of Nungon women work on the Nungon grammar project. Ealeal Semel ('07) - A Play Titled “Murder” - The play “Murder” is a political theatrical production dealing with the Israeli-Palestinian conflict, starring Israeli and Palestinian students from all facets of Israeli society. Lior Soroka('99) - After His Death (short film). “After His Death” is a ten-minute film independently produced and directed about a girl who, during her father’s shiva, discovers he had an affair with another man. Auren Weinberg ('87) - Second Helping Schools Project. Second Helping Schools Project teaches children about food insecurity, compassion, and eliminates stigma. Jonah Fisher ('06) - FLO Community Co-Working Space. Intentionally designed to build relationships, FLO is a community workspace in Tel Aviv all about connecting professionals to better their surroundings. Julie Geller ('91) - Setting the Stage. Love Julie Geller's music and message? Join a network of women who are uplifting and helping one another personally and professionally. Ben Wolfson ('11) - Pockets Against The Patriarchy. PATP brings utility and comfort to women’s clothing. We add pockets to business suits, fighting the fashion industry's sexism. The documentary series, “The Hitchhikers,” documents the spontaneity and richness of hitchhiking (and offering rides) in Israel. Nahara is an Israeli dance company for religious women with a professional, honest and personal approach that remains respectful of the religious observances of its members and audience. 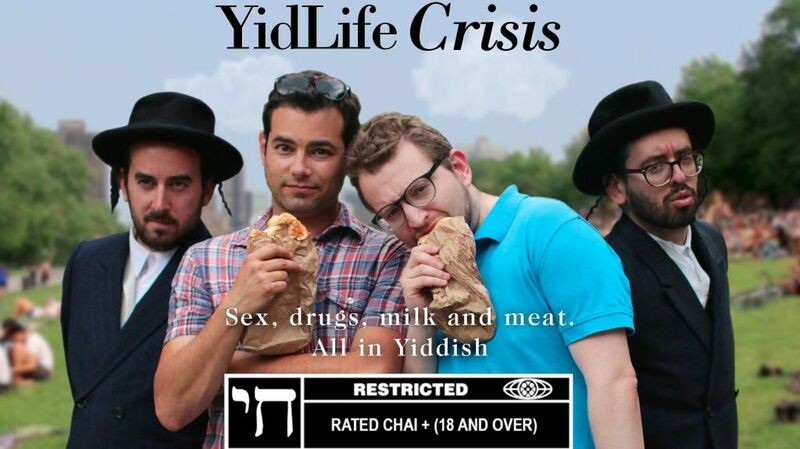 Yidlife Crisis, a Yiddish language web-series with a modern twist, is engaging with European Jewish audiences through both live presentation and filmed docu-travelogue videos. 2States1Homeland is a new Israeli-Palestinian initiative that aims to change the discourse around the two states/one state paradigm and offers a different approach: a confederacy of two sovereign states with open borders and joint institutions. Minyan Yedid Nefesh, based in Newton, MA, is a partnership minyan, which is constantly experimenting to fit the needs of its expanding community. The Leon Roth Foundation seeks to encourage a new generation to engage with Roth’s seminal works, to use his ideas to invigorate current discourse, and to bring Roth into dialogue with other philosophical voices. A 2-day conference on Roth will be held at the University of Toronto Centre for Jewish Studies with speakers addressing topics spanning Roth’s interests, including Jewish philosophy including ethics, Jewish education, and Judaism and democracy. Sewn Scroll is a Jewish fashion exhibition showcasing 7-8 original, hand sewn outfits, each exemplifying a differing stance on Jewish life and practice. Based at Princeton University, Alliance of Jewish Progressives unites Jewish students from across the religious and cultural spectrum to discuss progressive politics, social justice issues, and Jewish texts. This booklet will accompany the original artwork showcased in Meyer’s upcoming exhibition. It will serve as a guidebook in the gallery, but can also stand alone as a manifesto illustrating the artist’s deep conversation with Judaism in his work. The Hyde Park Teen Beit Midrash is a new Jewish learning program that will use chevruta learning to create a new community for middle school and high school students in Chicago. The program aims to develop Jewish text literacy, nurture a mature attitude to learning, and motivate excitement about Judaism through the creative energy of Torah study. Originally displayed at the Cape Town Holocaust Centre, the photo exhibition, “Women at Work” will now be featured in Flagstaff, AZ. The exhibit beautifully captures the work lives of South African immigrant and refugee women, and is accompanied by text from interviews with the subjects of the photographs. This project will revamp BRYTE’s existing library to provide books with characters that match students’ identities and abilities therefore enabling BRYTE tutors to have higher quality and more creative tutoring sessions. Paz’s sculpture series, Metal Beast, is an installation of fantastic, grotesque and delicate animal sculptures made of painted aluminium foil. The sculptural images are inspired by biblical, Talmudic and other visions and fables to create a dramatic scene which the viewers see from ‘behind the scenes’. The Jewish Women’s Archive podcast will bring together a diverse range of contemporary voices to discuss the meaning of Jewish life today, rooted in history, text, and contemporary cultural concerns. Yeshivat Kol Isha is a post-denominational women's yeshiva in Jerusalem. The Yeshiva integrates textual learning, spiritual practice and creative expression, celebrates feminist spirituality, and promotes women's leadership. Heart in the East is a student-led group at Hebrew University for members to discuss the many facets of Mizrachi (Middle Eastern Jewish) identity. The Beit Midrash for Torah and Life makes Torah study accessible to all and allows students to build relationships within their respective communities. The Jewish Parents Academy is a local Jewish learning center for Russian Jews. It offers parents and families high caliber, engaging, non-denominational Jewish learning and events. Yeshivat Maharat seeks to amplify women’s voices in Orthodox religious scholarship by supporting, printing and publicizing the written works of one of the school’s graduates, Rabba Dr. Anat Sharbat. YentaNet is paving the way in contemporary, pluralistic, individual-oriented Jewish match-making. YentaNet works confidentially, compassionately, diligently, and professionally with single Jews of all backgrounds, who are seeking meaningful, monogamous relationships with other self-identifying Jews. The Workmen's Circle is organizing two public, social justice-themed family programs: the 2016 Martin Luther King Day of Learning, Service and Action; and the youth-led, youth-built Purim carnival created with Jews for Racial and Economic Justice. The Wash U Jewish Film Festival (WUJFF) is a weekend of themed films that address different aspects of Jewish or Israeli life relevant to college aged students. YidLife Crisis is a video series hosted at YidLifeCrisis.com and syndicated across the web which aims to address the modern Ashkenazi YidLife Crisis: what is your identity when you're brought up with elements of “old country” Yiddishkeit, but are trying to carve out a modern 21st century identity in a secular world naive to the shtetl life? YidLife Crisis explores how to reconcile this dichotomy by following the lives of two bokher bachelors, Leizer and Chaimie (Eli Batalion and writer/actor Jamie Elman’s Yiddish doppelgangers), hipster 30-something Montreal Jews trying to hustle “careers,” pick up women and enjoy all that Montreal’s bohemian Mile End district has to offer except… they only speak Yiddish. They talk in Yiddish, text in Yiddish, sing in Yiddish, blending seamlessly into a Montreal linguistic backdrop of French and English. Jewish museums can fill a void in providing a meeting place for young Jews and offer cultural and historic connections. With the help of the Alumni Venture Fund, we created a buzzworthy, topical, engaging event about three upcoming exhibits, “Andy Warhol: Ten Portraits of Jews the Twentieth Century,” “Jews Who Rock: A Musical History Tour,” and “Stitching History after the Holocaust: The Life of Hedvika Strnad.” During these events, we have local artists and dynamic speakers showcasing their talents. A songwriter by hobby, I I draw inspiration from the narratives and idioms of the Jewish bible. With the hope that the fruits of these explorations may resonate with my fellow Jews and others who, from time to time, or all too often, feel estranged from the possibility of spiritual connectedness, I am collecting these songs into a professionally produced album to be made available to the Jewish community and beyond. I am the co-writer and key researcher for a historical comic drama explored through the perspective of Joseph of Nazareth, the father of Jesus Christ and husband of the virgin Mary. I have developed a curriculum called Home 2 Home that uses art to explore the meaning of home for children from immigrant families. My plan is to facilitate a weekly after school art program with children from immigrant Latin American families at a local Boys and Girls Club in San Jose, California. As a Jew, my empathy for the immigrant child’s experience of uprooting and re-rooting is the foundation for this project. I also realize that in an adult-centric world, children rarely get asked for their opinions and feelings about their present lives and it is even less common for immigrant children to be asked to share thoughts and emotions about their experience as migrants. Art offers an ideal way for children to formulate and express their personal perspectives. Huron’s Born This Way Campaign (BTW) is a respect, empowerment and anti-bullying initiative. It was launched in the fall of 2012 and is loosely modeled after Lady Gaga’s Born This Way Foundation (www.bornthiswayfoundation.org). BTW was created by Residence Life Staff at Huron University College to ensure our school is a place where people can live and learn without fear of being discriminated against or made to feel isolated because of who they are. As an educator, a writer, and as a Jewish transnational adoptee myself, I am interested in the following questions: How does the experience of transracial adoptees in the Jewish community today differ from when I was in high school, two decades ago? How could Jewish communities better include transnational adoptees? I plan to create a cohort of high school aged adoptees to explore these questions. Encuentros is a political education series conducted as community events consisting of conversations and workshops designed to deepen the knowledge and importance of organizing, leadership, advocacy, cultural awareness & grassroots visions of well being through the introductory study of politics and social movement history in New York City and beyond. An opportunity to learn and build solidarity among diverse immigrant experiences, this workshop will dedicate time to exploring the role of arts and culture in activism while applying innovative learning/teaching techniques that will center participant's experience in personal reflection and transformation aimed toward engagement and action in their community. The workshops will create an environment of trust and draw from the experience of belonging to a community to produce knowledge together and create collective visions for the future. Come & Listen is a podcast that transmits progressive Jewish responses to timeless questions in a beautifully crafted audio form. We provide listeners the opportunity to connect over ideas, history, personal narratives, and philosophies that perpetuate and innovate the conversation about our Jewish intellectual heritage, and support developing Jewish identities. The Sefaria Project will revolutionize the experience of Jewish learning and enhance Jewish literacy and engagement by building a free and universally accessible living library of all Jewish sacred texts. What is a living library? A library that evolves, grows, and interacts with its users, creating a space for conversation among a community of people who thrive on learning and sharing. Sefaria’s website will host this library of Jewish texts and their interconnections, in Hebrew and in translation. Sefaria’s scope is Torah in the broadest sense, from Tanakh to Talmud to Zohar to modern texts and all the volumes of commentary in between. Judaism's core texts grew out of millennia-long conversations and arguments across generations. Sefaria will create an open space for ancient conversations to continue in new ways, with new participants, new questions, and new layers of dialogue. Between The Lines offers a deep-dive into how Jewish Day Schools teach Israel's controversial narrative, and the students who emerge with quivering loyalty and often, strong cognitive dissonance come college. We explore the scope of content offered on Israel's history and the Israeli-Palestinian conflict in various Jewish Day schools across the country. We ask: Who structures Jewish day school curricula about Israel? Who decides what content to include and exclude? How do you sufficiently explore the Palestinian narrative in the context of a Jewish Day School, which has an obvious (and understandable) agenda of connecting young Jews to the State? What happens to now-college students who feel they were miseducated, undereducated, or too distracted to care at the time? We focus a critical eye on the responsibilities schools have to their pupils, especially when it comes to educating material that defines and shapes not only intellectual but religious identity - when it comes to teaching about a country that intrigues not only our insular community, but the world at large. I created an online store for women’s tzitzit (tallit katan), altering store-bought women’s undershirts by cutting and hemming the sides and then tying the tzitzit. To my knowledge, there currently is nowhere to buy women’s tzitzit, on the Internet or elsewhere. I have been creating our own tzitzit for several years, and I know of several other women who do the same. However, we recognize that it is unreasonable to expect everyone to both know how to sew and how to tie tzitzit. I created an easy-to-use website for the product, and though it will start with one relatively simple model, I would like to expand into other fabrics, colors, styles, etc. depending on interest. The tzitzit will be as low-price as possible, potentially even subsidized if it is feasible to do so, as the goal is to make this mitzvah as egalitarian and accessible as possible.